A lot has happened since we last checked in with JEFF. 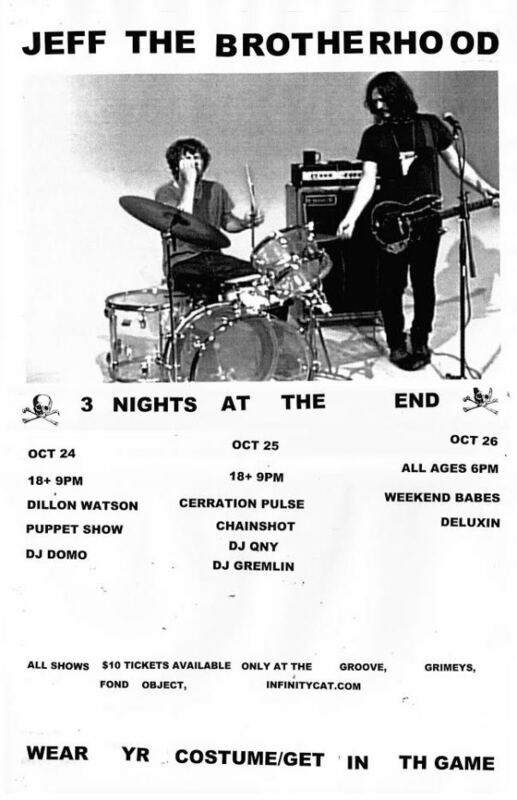 They’ve got a new LP in the can, a new EP already out, they’ve toured across the country and back with local buds D. Watusi, Music Band, and Diarrhea Planet, and now they’re bringing it on home with a three-night stint at the End later this week. You’ll get different openers each night, and an anonymous source tells us we’ll even get a different set each night from the Brotherhood of Light. Story time: I remember JEFF playing at the End with Hunx and His Punx and Shannon and the Clams in 2011. Their set came to a peak [as they do] with a pretty large chunk of the audience climbing onstage for the remainder of the show. It was a mostly familiar wild-style good time, but something definitely felt different. In that moment I thought, “I doubt I will ever be able to see JEFF play here again.” For three years, that prophecy has proven to be true, but wow. Look at that flier. What a groovy gift we have been given.